Once again we pause on Monday to remember the veterans who served our country proudly in times of strife. As a veteran myself I've written about this day for several years. 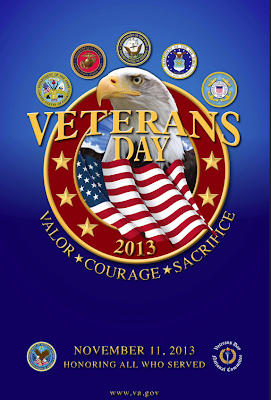 For those of you a little fuzzy on what Veterans Day is, and how it evolved, you can read about it HERE. This year at the Orange County Fair and Event Center on Monday there will be a large free celebration of veterans hosted by many of California's organized labor groups. COSTA MESA – To honor our Country’s veterans, union members, community groups and veterans organizations from across Southern California will be hosting a FREE community celebration at the Orange County Fair and Events Center this Veterans Day. Veterans, their families and the entire community are invited to celebrate our nation’s heroes with live music and entertainment, free hot dogs, and opportunities to give back by sending care packages overseas and making holiday cards for ailing vets. The event will also include a special stamp unveiling by the U.S. Postal Service, as well as information about family-supporting jobs, free wheelchairs and access to services for veterans. The event is being held in conjunction with the new “Veterans and Labor – Partners in Service” project launched earlier this year (www.veteransandlabor.com). Union members all around the state will be participating in volunteer projects and activities throughout the Veterans Day weekend, culminating with this very special “Honoring Our Heroes” veteran appreciation event. Sponsored by California unions, “Veterans and Labor – Partners in Service” aims to support and raise up veterans on three fronts: providing volunteer service, opening doors to good jobs and a special Veterans Day event to honor our heroes for their service. WHY: Those who serve our country in uniform risk their lives to defend and protect the freedoms we all value. But far too often, our nation’s veterans don’t receive the support they’ve earned or the services they need when returning home. California’s labor unions are taking the lead to change that. Learn more at www.veteransandlabor.com. I leave you once again with this very moving video clip with lyrics by Norah Jones. Find some time this weekend to thank the veterans in your lives. They deserve your gratitude. You know, as I left the City Council meeting just before midnight Tuesday I thought nothing could top it for pure political theater. I was wrong, and I only had to wait about 20 hours to realize it. Last night the Fairview Park Citizens Advisory Committee meeting at the Neighborhood Community Center was one for the ages. 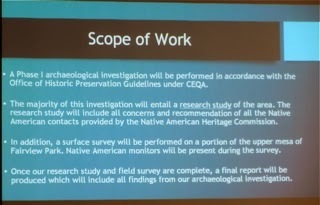 You can read the posted agenda HERE to follow along. 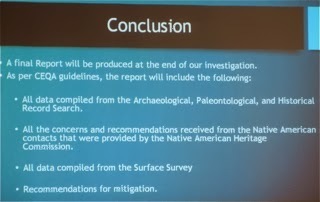 Because of the multiple presentations planned, as well as what looked like a pretty packed agenda, I estimated there was no chance for the committee to wrap up their business in the 90 minutes scheduled. In fact, it took more than double that time, finishing just after 9:15 p.m.
And I wasn't the only one who anticipated a special meeting. 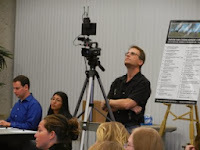 The official videographer for the current power elite in Costa Mesa, Barry Friedland, was there and ready to record the event. 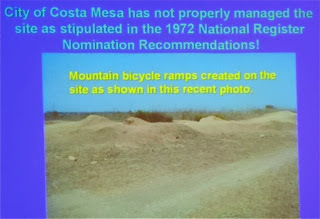 I must give old Barry credit - his YouTube Channel, Costa Mesa Brief, HERE, has a growing number of fairly well done video clips of his politician buddies. He expects his recording of this meeting to be available for viewing by early next week. I'm not sure he'll upload it all, since it was over three hours long. I'm looking forward to seeing how he edits it. And, Barry and I were joined by more than 100 attendees last night, clearly a record for this committee. It was an interested crowd, which I can only describe as favoring keeping Fairview Park as it is - with no playing fields. That's not a guess - it was easy to measure the sentiment of the crowd when they responded to member Anna Vrska's presentation, which I'll discuss now. Ms. Vrska has been a thorn in the side of some of the committee members almost from the day it was formed. She's young, articulate, very smart and works hard at gathering facts before making decisions. 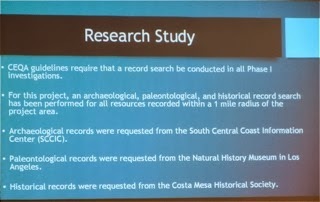 Her presentation was supposed to be about Youth Sports Data, and she did briefly touch on that subject, but only to admit that the City was unable to provide her with sufficient historical data because of software and database changes made it impossible to retrieve much historical data. She began her presentation about 6:05 p.m. and by the time she had completed it at 6:20 most of the other members of the committee were fuming. She used most of her time explaining the difficulty she had getting responses to records requests. 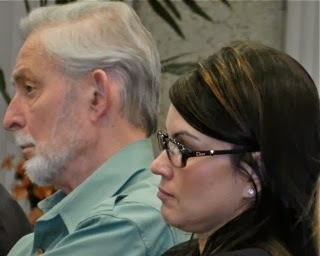 Later attorney Yolanda Summerhill, shown here with committee member David Stiller, said that she had caused the staff to expend 40 hours on her requests, including at least 10 hours with Vrska personally. This is very unusual because council members must get permission from the council as a whole if they anticipate a request they might generate would take more than 4 hours of staff time. 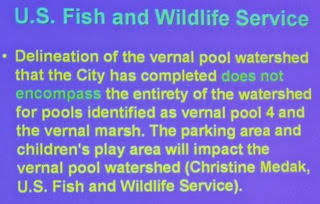 Back to Ms. Vrska... she opined that the committee has the cart before the horse - that there should be an assessment of whether anything needs to be done with Fairview Park BEFORE embarking on this mission. 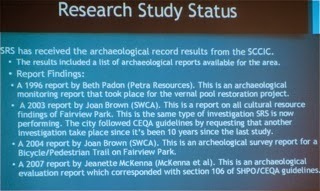 She is a great gatherer of statistics, so she quoted numbers of people who had spoken before the city council on this issue over the past several months, citing numbers that indicated almost all the speakers wished to have Fairview Park left as-is. 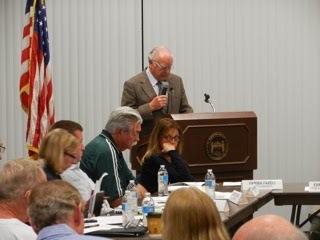 She cited a litany of reasons not to proceed - mixed messages sent by Mayor Jim Righeimer, for example. 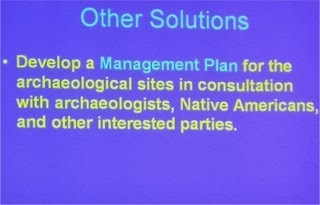 She also criticized the method used to hire consultants SRS, Inc. to do work on Fairview Park assessing the cite of the proposed new tot lot and parking turnaround. 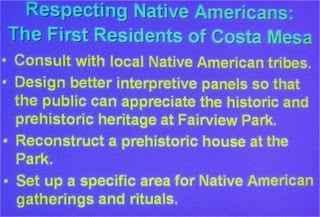 I won't go into great detail because you'll be able to see it for yourselves on Costa Mesa Brief. The biggest bombshell she dropped, though, was her claim that there may be bias in the composition of the committee - that she was the only woman and many of the men on the committee were friends with Mayor Pro Tem Steve Mensinger - who just happened to be sitting very near her. 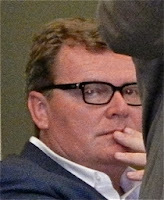 As I looked around I could see faces turning red among certain of those committee members. She also quoted a fairly recent column by Daily Pilot columnist Jeffrey Harlan, which likely also got some of the members blood boiling. And then she was finished and the crowd gave her long, long applause. That was how I measured the sentiment of the crowd. More fun was to follow later, though. 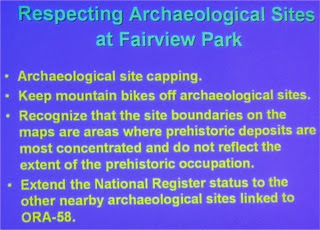 Then the committee heard from Dr. Steve James, a professor of archaeology from Cal State Fullerton who has worked at Fairview Park in years past and was standing in for the scheduled Sylvere CM Valentin. 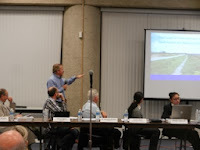 Dr. James' presentation was crisp and accusatory, citing failings on the part of the City of Costa Mesa in their responsibility to maintain and manage Fairview Park. 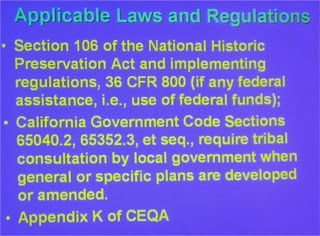 These dozen slides give you an idea of what he said. Next up was the team from consultant SRS. Paul Chase, who provided his background and some history of Fairview Park. 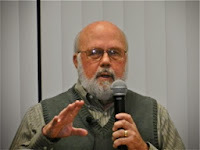 His brief presentation was interesting and professional. 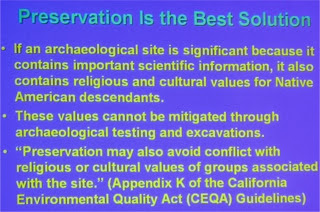 Then came Dr. Henry Koerper, a archaeologist with more than 30 years teaching the subject at Cypress College. 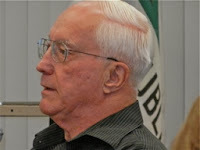 He, too, had done significant work in Fairview Park for decades and provided us with more fascinating history of the region. 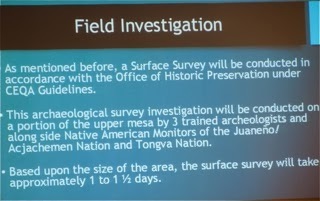 Then, at just after 7:00 p.m., came SRS Project Manager Connie "Destiny" Colocho, who provided us with a brief PowerPoint presentation of their plans, shown on the five slides that follow here. 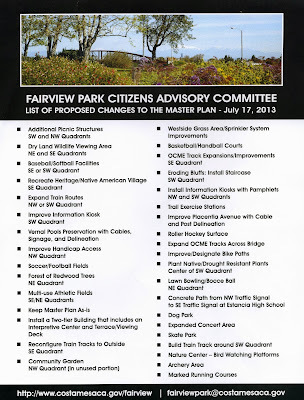 For the next 45 minutes we heard from a parade of 22 people (23, if you count Parks and Recreation Commissioner Bob Graham, who jumped up at the end of the speaker line to offer a view), nine (9) of whom expressed the view that part of Fairview Park should be dedicated to playing fields. All the rest opposed that kind of infrastructure. Watch old Barry's tape next week to hear their words. 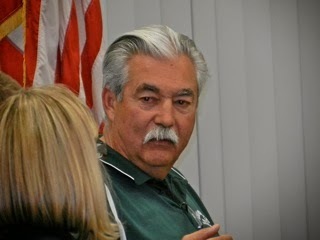 Several youth sports organizations were represented in that line of speakers - football, baseball, soccer, rugby and Parks and Recreation Commission Chairman Byron de Arakal - shown here in the cap with Recreation Manager Bob Knapp - gave us his view that the city is chronically short of playing fields, particularly lighted fields this time of the year, and that something MUST be done. The committee listened patiently to the speakers. By now it was 8:00, a half hour past the scheduled stop time and they were nowhere close to a stopping point. And, this is where the real fun began. 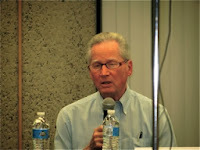 This was the opportunity for committee members to ask questions of the earlier presenters, and some did so with pent up anger. Vice Chair Steve Smith was first up, taking exception to some of Vrska's earlier comments and, in response to her claim of gender bias, quoted Dr. Martin Luther King's statement about the content of a man's character, not the color of his skin. 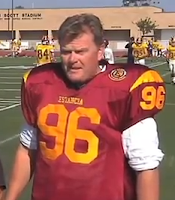 I thought that was peculiar, but he was angry. 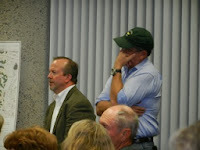 He asked her why she chose to investigate the field use when there are many other issues with the park. 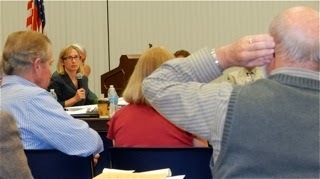 She responded that it seemed to be the way the committee was heading so she wanted facts. 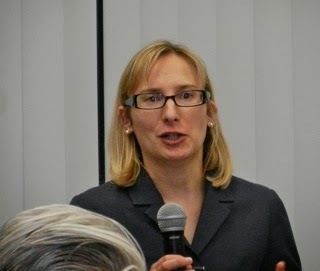 She said the information the committee had wasn't sufficient to make good decisions and, in response to his statement about the demographics on the committee, she provided statistics that demonstrated that women are severely under-represented on most city committees. Brett Eckles challenged some of her numbers and she admitted, based on subsequent conversations, that she needs more information. She tried to apologize to John Rubright of AYSO 120 for not contacting him personally during her canvass of youth sports organizations. Dennis Popp, the "other" gray-haired, portly blogger in town, condescendingly challenged her statement that the committee was made up of friends of the mayor pro tem, to which Vrska asked, "Am I wrong?" Popp said he would be proud to be a friend of the mayor pro tem. He didn't answer the question. They went back and forth and she told him she wasn't saying he was a puppet, but that the committee was compose mainly of like-minded people and, except for her, all men. 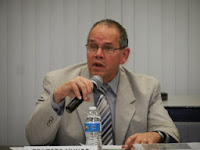 Lee Ramos demonstrated his disdain for her claims of the demographic deficiency of the committee by addressing her angrily in Spanish. 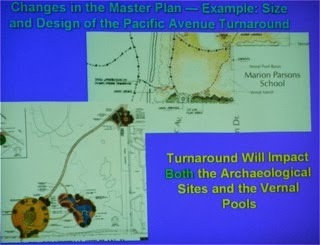 When it was Vrska's turn to question presenters she asked Dr. Koerper if the fact that he had originally been the one to delineate the boundaries of one of the Native American sites at Fairview Park wasn't a conflict of interest since he would be assigned the job of basically confirming his own findings? After some discussion the answer was no. 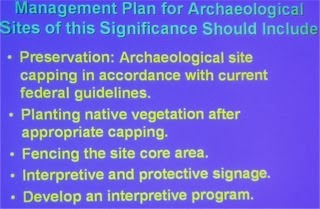 Chairman Richard Mehren asked the consultants from SRS if the "capping" - the method of covering sensitive artifact locations with layers of dirt and sand to protect them - wouldn't adversely affect the water flow to and from the vernal pools nearby. After some discussion Director of Public Works Ernesto Munoz clarified that SRS would not be working in that area. Vrska then, again, tried to explain the problems with the hiring of the consultants and attorney Yolanda Summerhill pulled her up short, telling her that the legal department had reviewed the process by which SRS was chosen and it passed all the checks necessary. 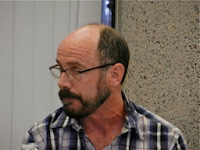 At this point Mehren, who has kept a fairly low profile as Chairman of this group, made a statement to the group in which he criticized the City for it's poor management of Fairview Park, citing the decomposed granite trail, a recent track meet, parking on protected areas by visitors to an event at Jim Scott Stadium and more. 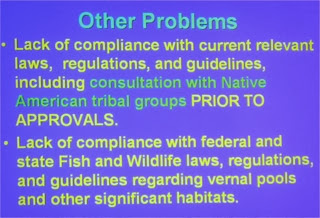 He cited the current involvement of the U.S. Department of Fish and Wildlife and state officials. Following that the major agenda item - discussing which kind of new features might be appropriate for the Northwest quadrant of the park - was a disaster. 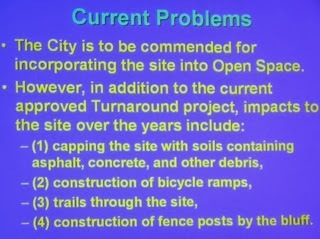 Parks Project Manager Bart Mejia tried to winnow down the 35 suggestions created in July, listed below, to determine which definitely would NOT be appropriate for that quadrant. Mehren then asked how many had actually walked that part of the park, stating that they couldn't make an informed decision if they had not walked it. That threw the entire discussion into a tizzy and the result was that they put it off until their December meeting. 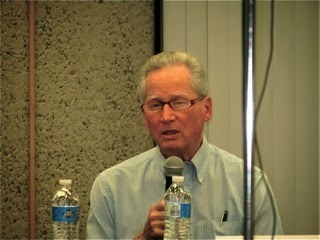 Vrska reiterated that she was offended that she was the only woman on the committee. She said she didn't intend to make anyone angry, but maybe the truth hurts. 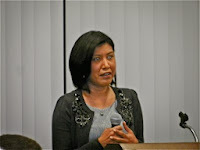 When she attempted to discuss the SRS hiring again Summerhill shut her off. When Vrska referred to her attendance at the Youth Sports Council and indicated that she felt very uneasy there Steve Mensinger awoke from his hibernation to reject that characterization, stating, "that's not accurate! ", and followed up by saying she had been welcomed and treated with respect. I found myself wondering how Mensinger knew how Vrska felt at those meetings. Then Ron Amburgey, who had been sitting near Vrska all evening, had his turn and he unloaded on her, telling her she was totally out of line. He said to her, "You're probably the least knowledgable person about the city on this committee. ", as if that had anything to do with the issues at hand. You could practically see steam coming from his ears. He complained about her statistics, so she offered him her pile of papers and told him he could check her numbers. OK, if you stuck with me all this way then you know that this was one of the most disfunctional meetings I've ever seen. 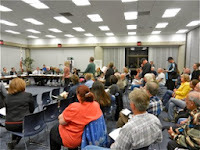 After three hours, much of which was filled with invective and recriminations, absolutely NOTHING was accomplished except we met dueling consultants and heard from nearly two dozen stakeholders. The work plan for this committee is exactly where it was when the evening began. The next meeting of this committee will be on December 4th and, as of this time, they won't meet again until February since the first Wednesday of January is the 1st. And, the final shoe to drop in this very strange evening was that Dr. Mehren - who has served as Chairman on this committee and on the previous version for two decades - was reamed by Mensinger and some of his "friends" at the end of the meeting. Pathetic!